Not like this one. We’ve written about BIC in the EBB before, but then it was still a cornfield. In one year, construction has advanced to the point tenant companies are moving in and until you see it, you don’t really “get” it. Well, not quite “open.” The official opening will be late in 2019, he said. BIC is still a construction site on Anthony Fokkerweg just off the N2/A2 autoroutes and abutting Eindhoven Airport. BERT-JAN WOERTMAN SHOWS HOW BIC WILL CHANGE EINDHOVEN’S SUPPLY CHAIN. But the first tenants are in, and the factory of the future will house multiple small-to-medium-sized companies. BIC is targeting flexible firms with high value, high complexity – but low volume – production that are first-tier and second-tier suppliers. For example, they might be making components for original equipment manufacturers such as ASML, the Eindhoven-based, global leader in photolithography, the foundational semiconductor firm. “(ASML CEO) Peter Wennink recognizes the supply chain for its importance,” said Bert-Jan, who is BIC managing director. This is all about building the regional supply chain for Brainport’s giant tech companies, providing them with components they need to innovate. One of the first tenants is Anteryon Optical Solutions, a Philips spinout that designs and makes industrial optics and devices for sensors, mechatronics and laser modules for photolithography and other processes in the semiconductor industry. Whew! So, yeah, this is 21st-century stuff. Which seems a tiny bit hyperbolic until you see it. The first of several buildings is gigantic, by our estimates 100,000 m2, or about 1 million square feet. This is all created by Eindhoven-based SDK Vastgoed, which is building this as its own initiative with its own capital. “This is one of the first campuses worldwide that is a bottom-up initiative,” Bert-Jan said. SDK has multiple projects in Eindhoven, including new construction in Strijp-S, one of the many sections of the former Philips manufacturing complex that’s being repurposed as housing and retail. The secret sauce, if you will, is what Bert-Jan terms “managed serendipity.” BIC is all about attracting next-gen companies by cultivating a next-gen campus culture, an environment that will foster collaboration and optimize business for tenants. Instead of a bunch of dislocated companies, BIC is about bringing everyone together. Part of that is the huge café and events area in the very center of the first building. That design means no one can go to their office or factory without going through the main entrance and bumping into people, Eli said. BIC’s social innovation is creating a people-centric advanced factory … building the social-interaction part, then building a factory around it. There’s a lot of energy dedicated to creating “the Silicon Valley of the Netherlands” or the “Silicon Valley of Europe.” But BIC follows the Eindhoven Model, with new technology coming out of big companies such as Philips or Technical University of Eindhoven. Then it’s enhanced by researchers at High Tech Campus Eindhoven on the way to evolving into a global powerhouse company. BIC, Eli and Bert-Jan contend, will speed up that process. “We’re not just building a factory, we’re building an engine that drives innovation in supply-chain to the OEM,” Bert-Jan said. Okay, we’re reading tea leaves here, but Tesla has us wondering if Elon Musk has a plan for Brabant Province, which includes Eindhoven. 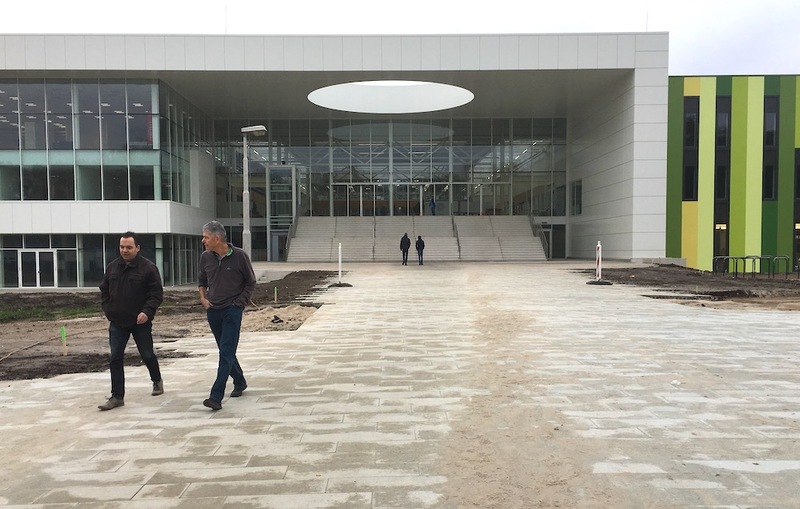 The reason we ask is, Eindhoven is getting the largest Tesla showroom in the Netherlands. It’s scheduled to open 13 December at Boschdijk 1111 north of centrum in Woensel Nord, according to media and local econ-dev officials. Interestingly, the electric car manufacturer has an assembly plant in Tilburg, just northwest of Eindhoven where – for the first time in Europe – we could see (but not buy) the new Tesla 3 this week! (We found out because Tesla sent invitations to customers in Germany and the Benelux who’ve put down deposits on the $35,000 vehicles to come visit – but not take home – their T3s, which still aren’t available in Europe). The factory in Tilburg assembles the Model S body shell, battery pack, powertrain/rear axle for cars sold in 12 countries. And of course, the 100,000 euro Tesla Model S is one of the best-selling luxury cars in Europe. Of course, Musk also said he was taking Tesla private, getting himself sanctioned by the U.S. Securities and Exchange Commission, and that he was thinking about moving to Mars, where he would probably die. Just like the Gigafactory2. Dispatches often touts the U.S. model of hyper-acceleration as a lesson for Dutch startups. Tesla has us rethinking that …. THE FIRST GIVE BACK MONDAY ATTRACTED A FULL HOUSE. EDZARD JANSSENS HOLDS FORTH ON THE HIGHTECHXL APPROACH TO ACCELERATION. There’s talking about building your tech ecosystem. Then there’s staying late to help aspiring entrepreneurs, teams and founders. For free. The HighTechXL crew put in a late night on 26 November with the debut of its Give Back Monday program. Give Back Mondays are open to all startups that can use some expert advice, direction, fresh thinking or maybe just a bit of encouragement. For GBM No. 1, we hosted 16 people representing 10 teams (yes, some had more than one startup.) It was, to say the least, an interesting mix with companies as diverse as a tech platform and a green roof company, an AI group and Mehmet Ali Anil and Basak Demirci, a team from Turkey building a digital feedback device for restaurants. Huddles were followed by networking with drinks and snacks. There were several interesting concepts, including Tony Gourdoparis’ concept of using wrist sensors to control computers with gestures rather than keyboards or other peripherals. Gourdoparis, a native of Greece, works at ASML. Brian Velda and Dennis Schaeps from Technical University of Eindhoven represented FruitPunch AI, an effort to build a talent/employer platform to make Eindhoven the AI capital of the Netherlands. Nick Nedelchuk, who is an IT developer at IKEA, is developing Localie, a travel app that customizes travel according to the language users speak starting with his native Russian. You can see the full details on the HighTechXL blog here. The next Give Back Monday is 21 January at HighTechXL’s new offices on High Tech Campus Eindhoven. Don’t forget to sign up here. • The Netherlands’ labor shortage has hit Roermond’s famous fashion outlet. Designer Outlet Roermond executives recently stated they’ll add 1,200 positions as the center, owned by London-based McArthurGlen, expands. The outlet gets about 7.5 million shoppers now, a number expected to grow to 10 million by 2020. But our sources on the ground told us they simply don’t think it’s possible to fill those jobs in the Limburg region, which includes Maastricht, and that some of the Outlet stores are short-staffed going into the Christmas season. The tl;dr version: American dude and Eindhoven resident launching a new, CA-authentic, takeaway, delivery burrito spot. Been lots and lots of work, real excited. Coming Jan 1st to Woensel. The address for the “Burrito Dude” flagship will be: Jan Heynslaan 46, Eindhoven. • DHVC Real Estate is the first real estate agent in Eindhoven to provide virtual 3D viewings and one of the first in the Netherlands. You can see a demo on their website, a demo that lets you rotate a property to view all the rooms and spaces and how they’re arranged. VERY cool. • Could the Evoluon become a design museum fittingly in the design capital of the Netherlands? The flying saucer-shaped events space near the center of Eindhoven was a novelty in its day, built back the 1960s, but it’s a little dated in the 21st century … and too small for large events. So, there are plans underway to repurpose the Evoluon, perhaps into a national museum for technology and design.